Meet Cat. She is a 12 year old pet sitter, who mainly pet sits cats. 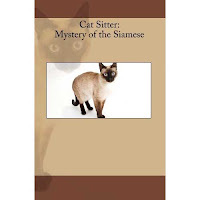 In this first adventure, Cat needs to pet sit her neighbors siamese cat Percy....but for some reason Percy is not acting like his adorable self. Can Cat discover what is wrong? While doing this job, Cat also attends school where she is taught to write a haiku poem and she writes one about cats. This book can be purchased as a PDF, a Kindle edition, or paper back from Amazon. If you are a homeschooler, it can also be purchased here. Cost varies from $2.00 to $6.50. I had the great pleasure of reading this story. It was such a fun book. My daughter LOVES cats. She thought it was cute and funny (her words (: ). She's just now learning to read and I had to help her with it a little bit. It's a chapter book so it's a little longer (but not TOO long) than what she was used to but she enjoyed it a lot. I would recommend this for any child that has a love of cats, mysteries, and funny stories. I really liked how the author added the element of learning in this book. It's not only a story but a learning experience. AND I have a treat for you! To enter to win just leave me a comment below telling me why you'd like a copy of this e-book. This giveaway will end on July 4th, 2010 at 11:59PM EST. Winner will be chosen using Random.org.